Everybody has a creative side just waiting to be explored. By spending quality time with your artistic imagination, you not only become inspired, you also become de-stressed, release worry and anxiety, you relax and become calm. Yes, art can be very good for your health as well as creating a beautiful piece of art for your environment. So…..when was the last time you were creative? 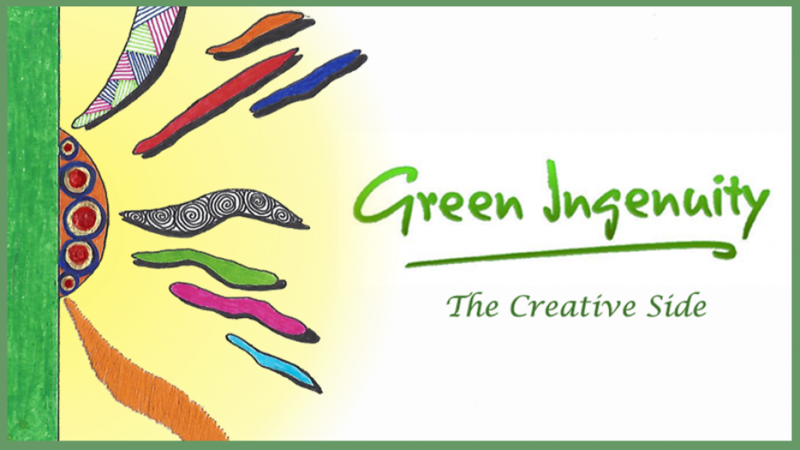 Green Ingenuity – The Creative Side would like to inspire your creativity through a variety of the fine arts. Instead of just selling supplies, we seek out art forms that are easy to learn, give you, the artist, inspiration as well as a sense of art mastery in a way that does not require years of skill development. We are starting out with going back to the basics of needle art; embroidery to be exact. Have you heard of Zenbroidery? It combines doodle art with embroidery. The kit images are fun, inspirational and beautiful. Quick and easy to do. You will be amazed at how easy it is to use your imagination in creating the piece and will be wanting to do more. You may want to go on to learning about the art of Zentangling itself, so you can create you own patterns. We will be able to help you on that path as well. Then there is Sachiko, Bargello, cross stitch, needlepoint, adult coloring, calligraphy and more. Get started with a simple Zenbroidery kit and get your creative juices flowing again.